As I wait for my newly ordered Kindle to arrive (I finally caved and promised the stack of paper books I’ve got on my bedside that they will still get read), I was excited to see news break today that Jeff Bezos is soliciting Apps for the Kindle. Starting next month, a KDK (Kindle Developer Kit) will be made available. Granted, the E-Ink format likely won’t be able to compete with whatever flash comes out with the iTablet, but it’s good to see Amazon strike now, before Apple gets into the game. So I had to wait seven months for my pre-order to fill. So I had to wait an extra week thanks to some issues with shipping. So I’m now OCD about tracking nutrition, sleep and activity data. I fracking love this thing. I’ll get a full review up after I’ve had a bit of time with it, but it rocks so far. It was also far more accurate than I ever imagined at the gym. I didn’t think the technology would track my activity on the Precor ellipticals, but it gave me an accuracy of about 85% or 90% relative to the miles and calories measured by the machine. Not too shabby. The Logitech Anywhere Mouse MX comes with an easy to use USB wireless plug and lives up to the billing. One of the conundrums that is often discussed and taught in economics 101 is the pricing paradox of water and diamonds. Diamonds are quite pretty, relatively rare and do have certain, adapted uses other than simply being set in jewelry; however, as a whole, they are far from a critical object. On the other hand, water is indispensable but, in the industrialized West, relatively plentiful, even in clean, drinkable form. So why are the low-utility diamonds priced so much higher than the imperative, life-sustaining H2O? In the everyday life of a lawyer, few things are as important as having good lighting, a comfortable chair, an ergonomic workspace and a reliable mouse. What’s that, you say, on the end? Yes, the mouse is, as water is in the marketplace, an undervalued commodity. This past year, I’ve dealt with a computer setup that has frustrated me at times. My mouse didn’t quite stretch to the edge of my desk, so while using the mouse, I’d find myself haunched over my desk a bit. My back started bothering me and I realized that my setup was no longer working. When my industrial issue Dell mouse started giving out (requiring a quick un- and re-plug of the USB cord), I’d had enough. FitBit: It shipped… and then it didn’t. The FitBit oozes cool in both looks and function. Monday night I got the email thousands of fitness freaks and/or gadget geeks have long been awaiting: my FitBit, ordered months ago, was finally ready to ship. True, I haven’t waited 13 months on pre-order status like some, but I was jazzed to finally be off the list and ready to ship. Unfortunately, upon checking my status manually to see if my Bit had actually shipped, I discovered that there was a problem charging my credit card… meaning that I’m still not off pre-order status. No, despite the wait, my credit card did not expire while waiting for this to ship and charge. I’ve yet to figure out why it didn’t charge, but I’m not at the point where I am ready to say this order is cursed, but I just want my dang FitBit. The FitBit has been the down low, “it” geek toy for several months now. I pre-ordered mine way back, but still haven’t gotten my notice that my order was ready to fill yet. The good folks at FB informed me it would be soon, but couldn’t give an estimate. Still, all the reviews are pretty good, so I’m waiting with bated breath. I do most of my shopping on Amazon and love Amazon Prime (which gives me free 2 day shipping… which I pay for… but do so once a year so it seems like its free). You’ll note that I will link to books and occasionally other items to Amazon.com where you can buy things. I don’t do this because I’m getting a cut (I don’t know how that would work), but because I shop on Amazon. One of the worst parts of shopping is unpacking (which sometimes makes YouTube unboxing videos a bit more complex). Jeff Bezos, the man who made Amazon a reality and revolutionized shopping, wrote the below letter to customers about efforts to make packaging more buyer friendly. 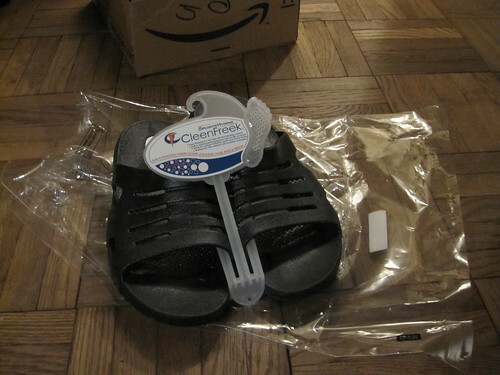 I experienced this myself just last night on receipt of one of my more recent purchases: CleenFreak comfy shower shoes for the gym. I’ve been having issues with overwearing my flip-flops (both because I sprained a toe and because I’m over 30 and shouldn’t be walking around NYC in flip-flops — it looks immature, as opposed to shower shoes, which just look crazy). Anyways, the shoes arrived in a simple to open plastic bag with a simple to remove plastic keeper-together. Perfectly timed for this queued up post. So maybe it’s not really a sell out. It’s just being lazy. But I feel guilty about sticking with AT&T in upgrading my phone and recommitting for another two years. All in all, I was assisted by a lovely customer service operator who matched the Verizon Bold price and tossed in a large account credit and free shipping (the free shipping always is what gets me… damn you Amazon Prime!!!). So two weekends ago, me and my buddy went to CitySports on a mission. That mission… to better commune with nature through funky shoes. Ok, not so much with the communing, but yes with the shoes. 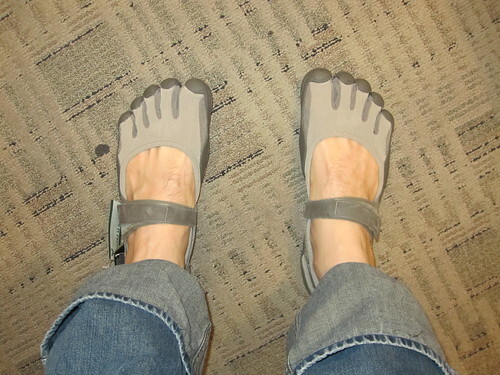 Although fitting them was a bit bizarre (I was 3 sizes larger than I should have been, whereas he dropped a size vs. normal shoes), I instantly took to the Vibrams. I wore them out of the store, into St. Patrick’s for a quick stop (and an inappropriate altar boy crack… and humble apology therefor) and all the way home. I got a few stares, but I can hardly blame anyone. I look a bit like a freaking hobbit in them. The basic concept of the shoes is simple. Unless you’re a biblical literalist (or a moron) you know that the human foot has evolved over millions of years, with at least 4.4 million years of biped evolution. As such, it’s a pretty good bet that natural selection has provided us with a pretty solid footing on which to walk, jog and run. Humans threw all that out of the window by introducing the sole three and a half or four thousand years ago. Suddenly, our toes no longer held a grip. Our feet were turned into a connector to the slat that touched the ground for us.